Although we tend to be a bit obsessed with all things Disney nowadays, it was really our shared interest in animation is what brought us together in the first place and was the jumping point into the World of Disney. I think as a community we become really protective of the company, it's output and easily forget that other people and companies can also make outstanding works. 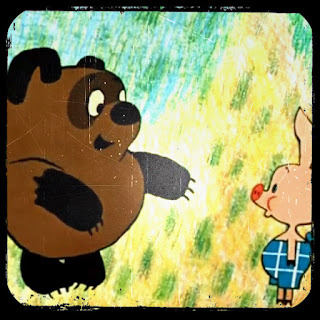 Almost as long as the Disney company had been making great animation and telling wonderful stories stateside, the Russian animation Studio Soyuzmultfilm has been doing the same. Most of their stories tend to be original, but in 1969 they released their first of several films based on A. A. Milne's Winnie-the Pooh. Although I highly recommend exploring Soyuzmultfilm's films, especially their stop animation work, I though being able to provide a comparison would be the best place to start. Watch their take on these familiar tales. It really reminds me that as engulfed I am in all things Disney, I shouldn't forget to stop once in a while a appreciate something else. Soyuzmultfilm's take on the Winnie-the-Pooh story and characters (or as I call it 'Winnie Pooh') is nothing short of tremendous. It's a bit simpler than the Disney versions in terms of animation and design, but are nonetheless great. Pooh himself is a darker, more serious character physically and visually. I just love the way his feet aren't attached to his body. The backgrounds are wonderfully child-like and the songs are whimsical and catchy. The other characters are portrayed in very different manners, but I love everyone, especially the adorkable Rabbit. Quite honestly, you don't even need to speak Russian (I certainly do not) or have subtitles to appreciate them. The story telling through character movements and interactions, song and animation is so good it could have grunts rather than words and it wouldn't matter in the least. I won't say anymore about it. It just figured I should share some other non Disney animation that many people will never have the pleasure of seeing. Luckily, many wonderful people have posted the films on youtube.com. I hope you take the time to watch them and enjoy them as much as we do. Leave us some comments and let us know what you think. I've posted the 3 parts to what I believe to be the first film below. These have English subtitles which is nice.